Getting your retirement budget in order can be tricky. There are so many possible expenses to worry about – especially if you’re a homeowner. Wouldn’t it be nice if you could guarantee that your property tax payments would stay the same for as long as you lived in your home? Thankfully, our state legislators want seniors to be able to retire with some added peace of mind. In the late 90s they instituted the “Senior Freeze” property tax reimbursement, which caps your property tax payment the year you qualify, and then reimburses you for any future hikes. The reimbursement also applies to mobile homes and caps their lot fees. At first, the income limits were very restrictive and the Senior Freeze reimbursement only helped seniors with incomes well below the poverty line. The limits were even more restrictive for single retirees. Since then, the limits have been raised to fall in line with larger retirement incomes and, in light of the number of widows and widowers in this age category, the limits are now the same regardless of marriage or civil union status. 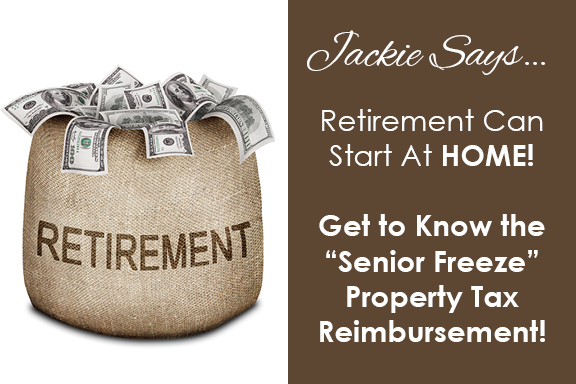 First, you must be 65 years old and a resident of New Jersey for at least 10 years – regardless of whether you were renting or already owned a home during this time. Also, when you apply, you must have owned the home you’re freezing the taxes on for at least 3 years. Some categories of property do not qualify for this assistance. Vacation homes and solely tenant occupied income properties do not count, and neither do properties with four or more units or more than one commercial rental inside. As of 2013, the income limit for applicants was $70,000. This total includes some categories of income that aren’t taxable in New Jeresey, so make sure to factor in things like disability and social security income as well as tax exempt interest. Additionally, you must pay the full amount of your taxes or lot fees before you receive the reimbursement, so it’s important to budget accordingly. The hot new news on this program is that there is proposed legislation to improve it for seniors who are looking to downsize or relocate within the state. Currently, if you move after establishing your Senior Freeze, you need to start all over again and re-apply after a year. State Senator Nia Gill has introduced a bill which would preserve your tax freeze as long as you buy a home of equal or lesser value to the one you’re leaving. This bill hasn’t reached the voting stage yet, but it’s another great step towards making this state livable for the retirees who’ve come to love it.